View cart “Venice Light & the Landscape Course” has been added to your cart. 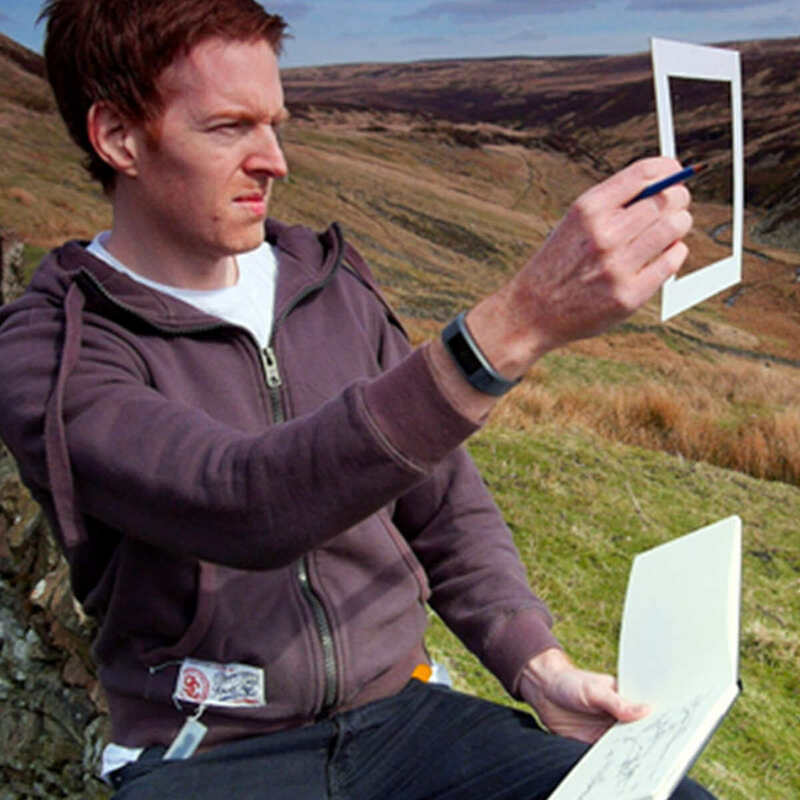 Feeling daunted at the thought of drawing outside? It seems laughable, doesn’t it? To be scared of drawing. However, with 80% of people scared of public speaking, it’s not surprising that public sketching can cause those same knots in the stomach, butterflies and anxiousness. Standing outside with your sketchbook, eagle-eyed onlookers behind you can unnerve even the most confident amongst us. It’s easy to see how your sketchbook can stay firmly closed. But this perception of what people think is often misplaced. They’re not judging you, they’re admiring you. 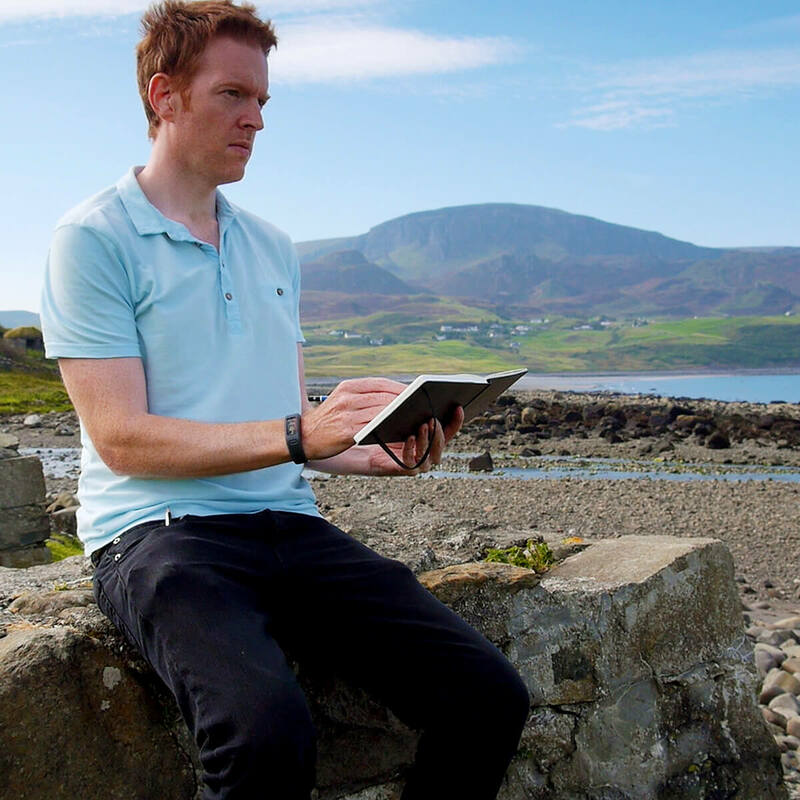 This landscape course is all about drawing on location, learning how to quickly capture the atmosphere and mood of a landscape like an artist and taking the next step from sketching at home to sketching outdoors. 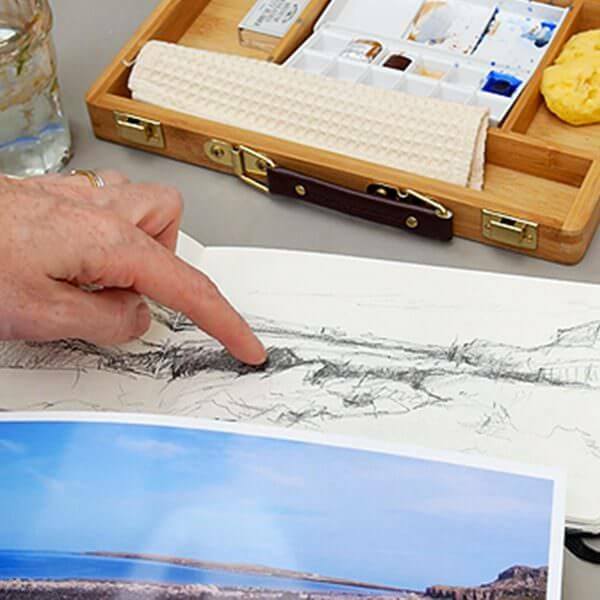 With over 3 hours of tuition, you’ll learn to combine on-location drawing demonstrations with drawing theory and studio-based drawing tutorials, be introduced to practical materials you’ll need to draw outdoors as well as discovering a 7-point checklist to create successful landscape sketches. Working through these simple step-by-step tutorials, you’ll learn how to capture, compose, and balance the scene in front of you and then take your ideas back to the studio for further refinement. You’ll develop the habit of thumbnail sketching, gathering reference information and using your sketchbook to its full advantage without feeling pressured to make every piece a finished work of art. Just like you, I used to suffer from a fear of sketching on location. The insecurities that my sketchbook was being judged held me back. What if someone looked over my shoulder to see a ‘bad’ drawing? What would they think? That I was a bad artist, that I couldn’t draw? I learned that when I wanted to get something on the page quickly, I had to adapt my methods. I decided to ‘draw’ with brush and ink, not a pencil so that the ‘drawing’ could get through that awkward stage and start to resemble the subject. I felt more confident with a brush, the marks could be bolder, looser. It could give the impression of a tree, a building, light and shade in easy strokes rather than laboring over a detailed pencil sketch. It works and I believe it can help with your sketching problems, too. I moved on from brush and ink to a much more travel-friendly toolkit that combined them both. My ‘secret weapon’ became a Brush Pen. I could be much freer with the marks, create detailed lines alongside broken edges and it forced me to be definite, no more erasing areas and starting again. Making a mark and leaving it. The brush pen combined the flow and convenience of a pen with the variety and texture of a paintbrush. Changing your mindset from pencil to pen, and from long detailed drawings to quick expressionist sketches can revolutionize how you approach your sketching, giving yourself permission to enjoy the process and atmosphere of the sketch as much as the finished piece. 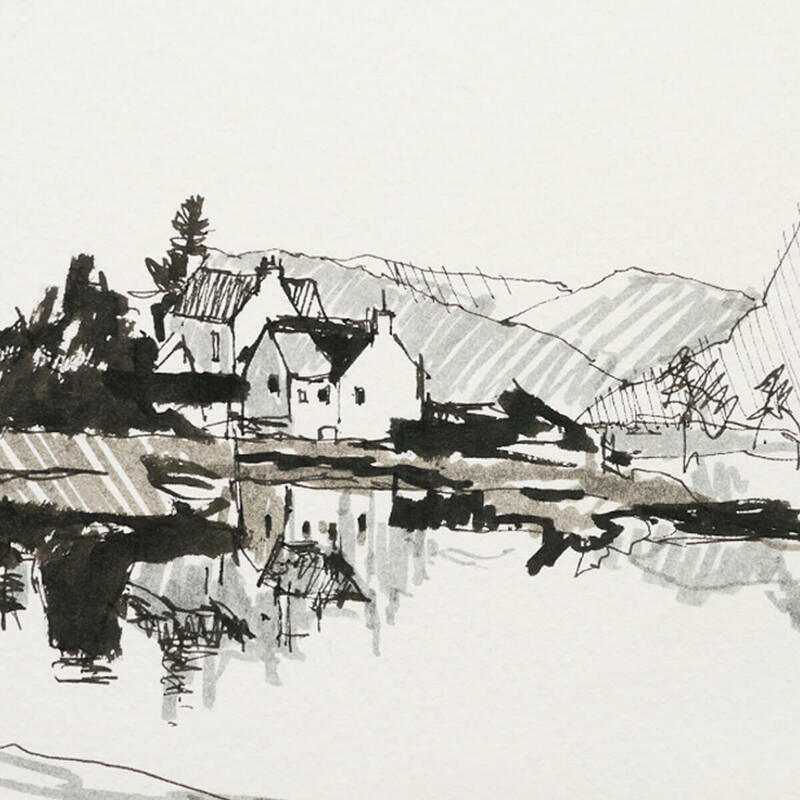 Simple principles that make your landscape sketching 100% more powerful. However, even with the right tools many students still find they are overwhelmed by transferring a vast landscape onto a small sketchpad. Trying to create a realistic perspective and depth, including a focal point and choosing what to draw, when there are so many potential viewpoints in a landscape, can result in frustration for the student. I see the same compositional mistakes coming up again and again so I want to focus on the theory behind ‘how’ to choose a good composition for your drawings, the thought process I use when deciding what to include (or what to leave out) in a drawing. I’ve developed this course to show you exactly how I approach landscape sketching, the materials I use and how you can do the same thing. The course is a mix of real on-location sketching with studio-based lessons and concepts. So you can learn the steps in the studio and then see how they translate to the street. On-location drawing demonstrations in Skye, Scotland and the Peak District, England. Studio-based drawing & watercolour tutorials. 12 follow-along drawing demonstrations (including watercolour wash drawings). 7-downloadable video lessons, split into separate chapters that follow on sequentially. Step-by-step instructional videos so that you can follow along at your own pace. Downloadable jpeg reference images and drawing worksheets to work from, and a full materials list. Over 3 hours of detailed video instruction. Lifetime access, downloadable on separate devices. A visual introduction to a smart minimalist collection of the materials you’ll need when you’re sketching on location, from sketchpads to pens. Introduction to the key principles when creating a compelling landscape sketch. Choosing a focal point, learning to be selective with your composition, changing viewpoints, how to frame your view, proportion & scale and tackling simple perspective. A flat drawing versus a drawing with depth. A couple of on-location drawings in Scotland, demonstrating the importance of getting your positioning right before you even pick up the pen. How to get the most out of your sketchbook, from gathering reference material in detail, preliminary sketches for a painting in mind to relaxing sketches on holiday. A practical tutorial on bringing your sketchbook back to the studio and working up a drawing to a more finished piece. Learning a few basic techniques to deal with the changing landscape around you can really help when out on location. Cloud formation sketches followed by a tonal tutorial on water and reflections. Looking at how to approach drawing individual elements of the landscape so you can include them with confidence into your sketches. Demonstrating houses and buildings, rocks and mountains, trees and foliage. Exploring quick ways to create mood and atmosphere into your sketches. Experimenting with different mediums to establish a tonal range, pen & wash, watercolours and marker. The final piece challenges your skills with a vast landscape, bringing all the lessons together. A ‘Getting Started & Materials List PDF‘ – which includes your materials list. A ‘Your Landscape Drawing Downloads’ PDF guide – which includes all the reference images used throughout the course. The video files are large (2.5 GB in total) so you need a broadband internet connection and enough space on your computer hard drive. A broadband internet connection – the files sizes for the video lessons are quite large (2.5GB in total) so can take a while to initially download (depending on your internet speed.) Once downloaded, they are yours to keep forever, watch without buffering or take to the garden and watch away from an internet connection! Enough free space on your Computer or iPad –You can download the files to a separate USB stick if you need more storage. Just completed your landscape sketching course – top notch. Not easy to find a quality artist who can teach. The online medium suits you. Time to start on the light and shadow course. I had a lot of fun with this landscape sketching course. As this is my main point of interest, I will keep looking back to this video to glean more of what I may have missed before. Thank you so much for this, I really enjoyed it and looking forward to the next course! I really wanted to send a note of appreciation for your courses and the carefully thought out way in which they are structured and especially the up-close way in which they are filmed and without unnecessary chat. It really is like being present at a studio demonstration. I think your courses are way ahead of anything else I’ve found online. Oh, I’ve also attached a photo of the final watercolour of Staffin Bay from the landscape sketching course – which turned out quite well, I think. I was thrilled to see the video films of the Skye landscape which were so evocative because I haven’t been to Skye since I was a teenager. Thanks again!